I tried out a fidget spinner for the first time just a few weeks ago, when I bought one for my son-in-law Andrew as a birthday gag gift. Though he’s not a hunter, Andrew loves camouflage, so I chose a sturdy metal spinner in a Mossy Oak pattern. He seemed appropriately amused, played with it for a minute or two and then set it aside. Lucky for me, Andrew accidentally (I think) flew back to Colorado without his gift. I’ve been enjoying it ever since. For those of you who haven’t yet had the chance to test drive a fidget spinner, here’s the lowdown. Three identical paddle-shaped blades, each about an inch long and with a hole in the end, are attached to a finger pad filled with ball bearings, which allow the blades to rotate around the pad with very little friction. Apparently, the physics of this design are somewhat complex and, I confess, a little over my head. Not surprisingly, though, you don’t need to know a thing about science to have fun with a fidget spinner. You just pinch the finger pad between your thumb and whichever other finger you choose and then flick one of the blades. Voila! You’ve mastered this low-tech toy. There are countless ways to fidget. You can hold the finger pad with one hand and flick the blades with the other. Or you can do it one-handed, which hasn’t worked well for me because my hands are too small and my fingers too short. You can hold the spinner parallel to the ground or perpendicular. You can spin it clockwise or counter-clockwise. And there are countless design options, ranging in price from a couple of dollars for a flimsy plastic fidget spinner to hundreds and even thousands of dollars for those made of precious metals. Spinners come in a variety of patterns and color combinations. Numerous websites invite consumers to customize their own fidget spinners. Advocates claim that fidget spinners improve focus for children and adults whose minds tend to wander and that they calm folks with too much stress and nervous energy. 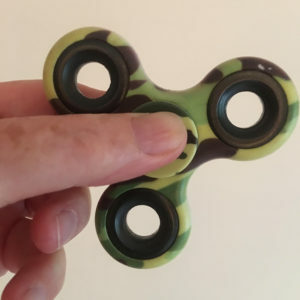 Though there’s no scientific evidence that they’re an effective treatment for autism or ADHD, fidget spinners are used in some classrooms to help relax and redirect students with those issues. On the flip side, spinners have been banned by some schools as time-wasters and distractions. From where I stand—or sit—fidget spinners are the perfect toy, even better than yo-yos, which were all the rage when I was in grade school. Spinners are small enough to fit in a pocket. They’re quiet. They don’t need batteries or electricity. And they sure don’t need an instruction manual. You can use them almost any time, anywhere. My favorite place and time is on my sofa while I’m watching the news. These days, it always makes me fidget.